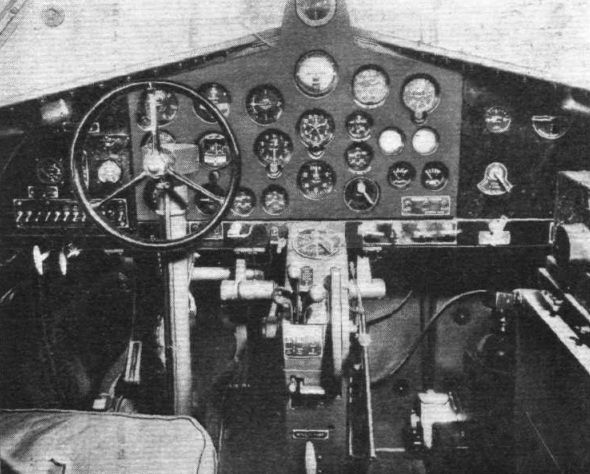 A MODERN "CONTROL ROOM": The cockpit of the single-engined Vultee V-1A, which cruises at 215 m.p.h. 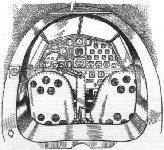 The usual instruments for normal and blind flying can be seen, as well as the airscrew pitch adjustment, and the flap and undercarriage retraction controls. STRAIGHT FROM THE SHOP: The Miles "Falcon" was only delivered to Mr. H. L. Brook on Saturday. 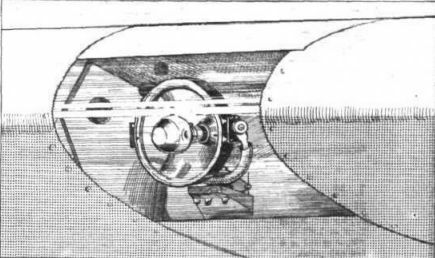 Note the position of the extra tank filler cap. 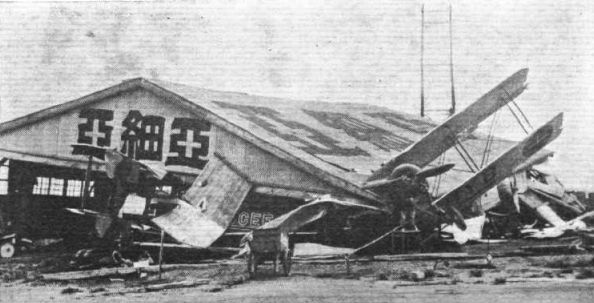 "WINDS": This is not the result of a bad landing, but an idea of the serious damage caused to aircraft and hangar at the Asia Aviation School, Tokio, by the typhoon that swept Japan recently. It may be noticed that the disintegrated machine is (or was) apparently an Avro type 504. 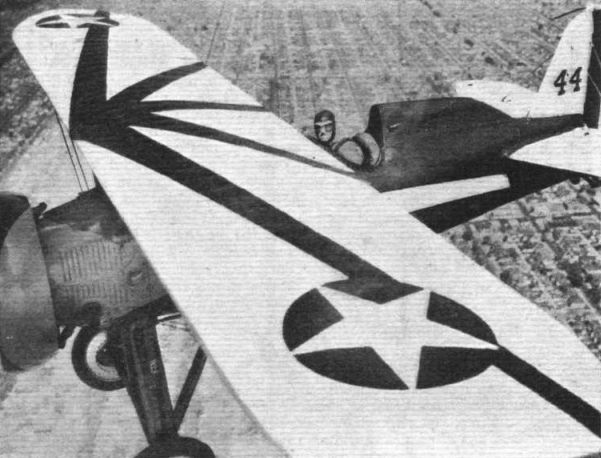 THE CUBIST: An unusual aerial view of a U.S. Army pilot flying above Selfridge Field in a Boeing P-26 pursuit 'plane. 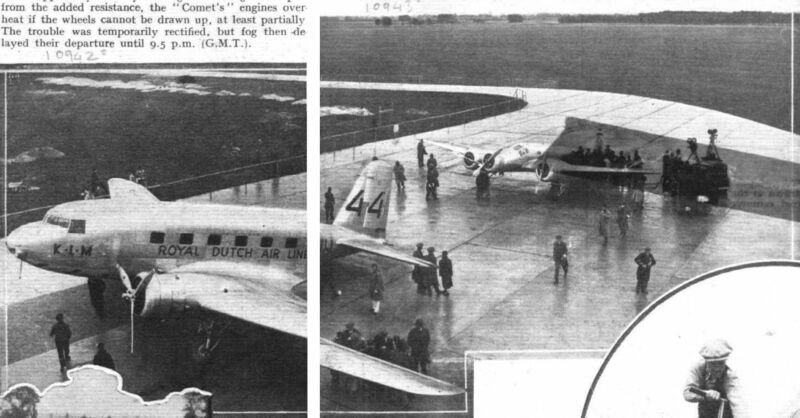 A NETHERLANDS PAIR: The big Douglas DC.2 (two Wright "Cyclone" Fs) flown - with three fare-paying passengers - by K. D. Parmentier and J. J.Moll, and, behind is the Panderjager. 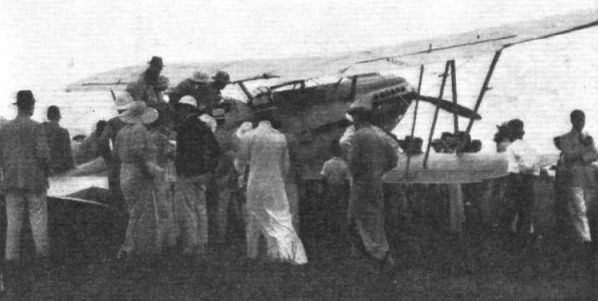 GRACEFUL - BUT UNLUCKY: A rear view of Asjes's and Geysendorfer's Panderjager (three Wright "Whirlwinds"); an undercarriage failure at Allahabad put them out of the race. 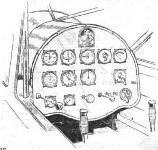 There are between forty and fifty dials on the Panderjagers' instrument panel. 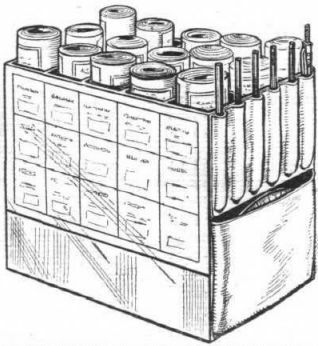 A case of maps and charts, complete with pencils, protractors and compasses in the Panderjager. 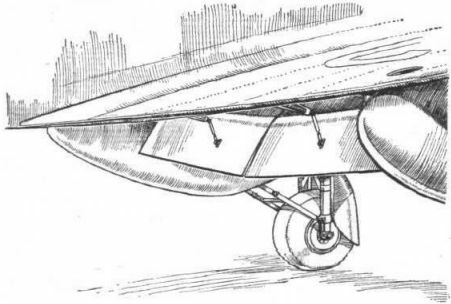 Unusual aileron arrangement on the Panderjager. 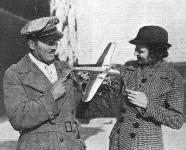 A NEW WORLD'S RECORD: Flying the Cant Z501 flying, boat (Isotta-Fraschini Asso 750) on Oct. 18-19, the Italian pilot, Mario Stoppani, flew from Trieste to Massana, Eritrea, a distance of 4,122 km. 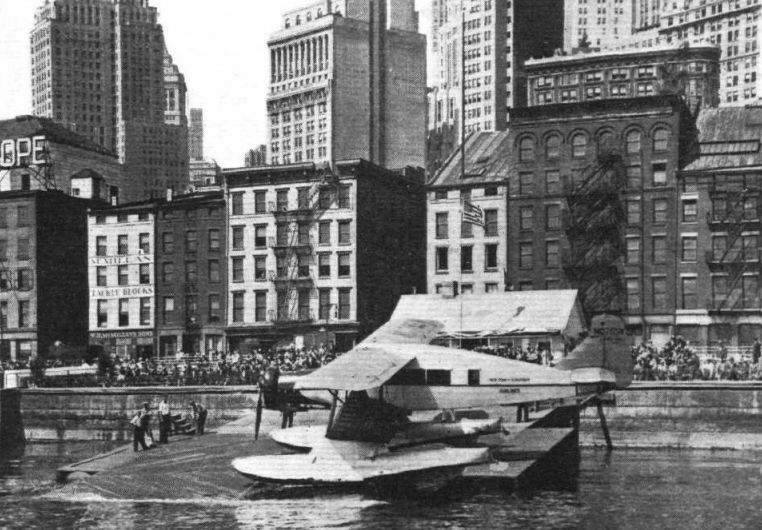 (2,561 miles) in 26 hours 35 minutes, thus establishing a new long-distance non-stop record for seaplanes, subject to homologation. NOT A NASTY ACCIDENT: But a new use for the Autogiro in trailing Kellett Sky Signs. 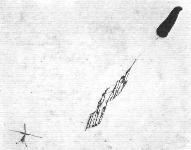 The signs consist of large letters (seen end-on in our picture) joined together and attached to a drogue towed some 400 ft. behind the Autogiro. ON MACROBERTSON EVE: An impressive scene on the apron at Mildenhall. 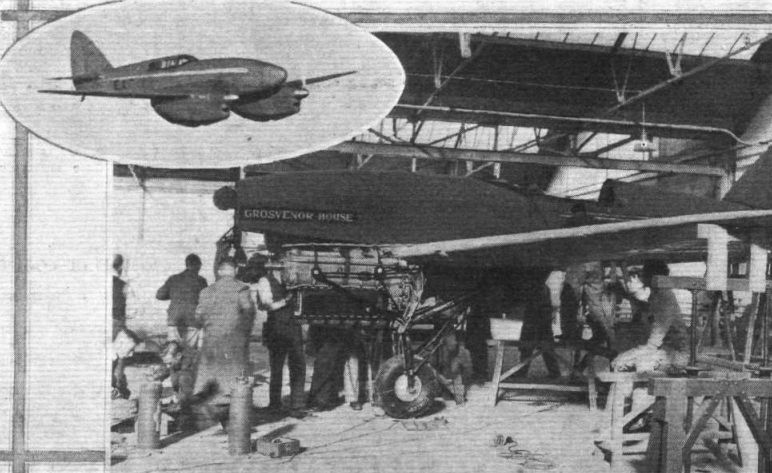 On the right stands Jones's and Waller's "Comet," with its undercarriage undergoing last-minute repairs; Baby Ruth is at the compass base; in the centre is the Mollisons' "Comet"; behind it are Hewett's and Kay's "Dragon Six" and a D.H. service "Dragon"; and in the background the "Gee-Bee" is being run up, while the ill-fated Fairey Fox can be discerned. 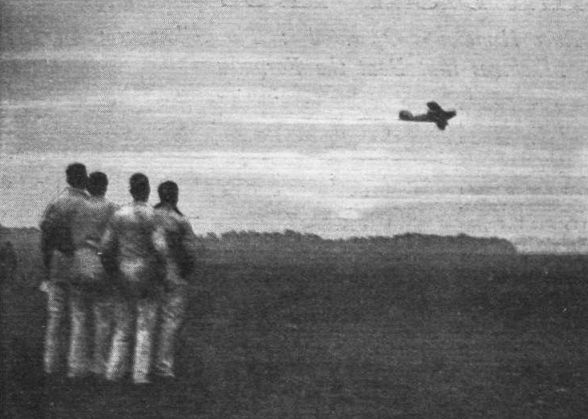 BRER FOX, HE FLY HIGH: A group of interested spectators round the Fairey "Fox," which gave demonstrations at Shanghai. 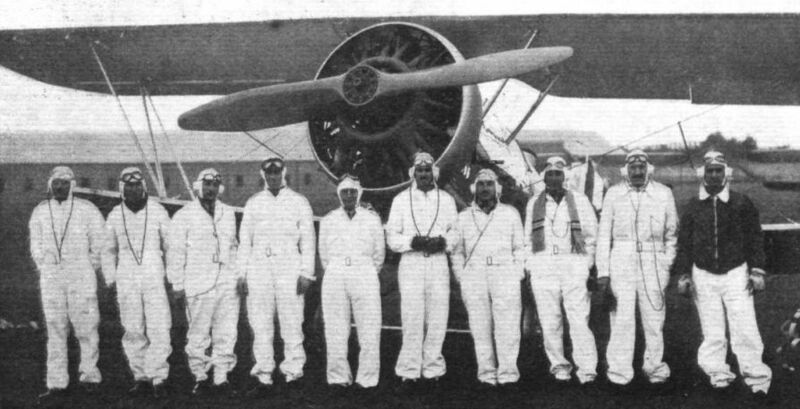 IRAQI OFFICERS: A group of pilots and observers who are flying the "Audax" ("Pegasus") machines from Lympne out to Iraq. 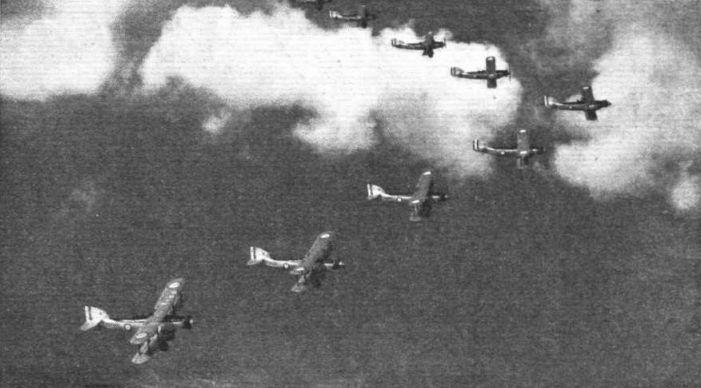 SQUADRON "V": Fairey "Gordons" with Siddeley "Panther" engines flown by No. 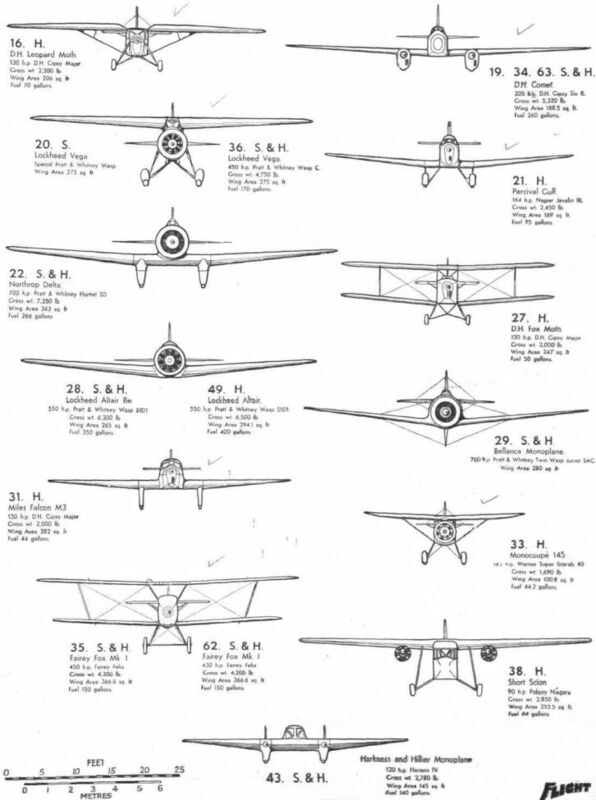 40 (Bomber) Squadron. FOR THE MARSEILLES-ALGIERS LINE: Two views of the Breguet "Saigon" at her moorings. Her ancestry is quite apparent. 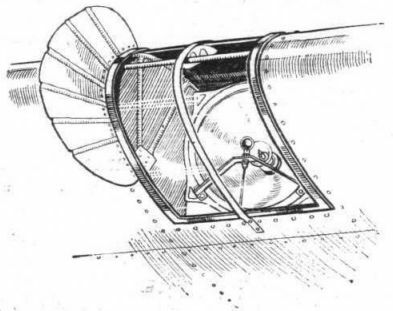 TANKAGE: There are three of these "semi-cyilndrical" tanks in the fuselage of Kay and Hewett's "Dragon Six"; together they hold approximately 230 gallons of fuel. 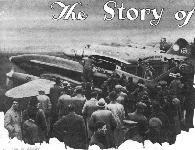 The Douglas D.C.2 (two Wright "Cyclones") piloted by Parmentier and Moll. 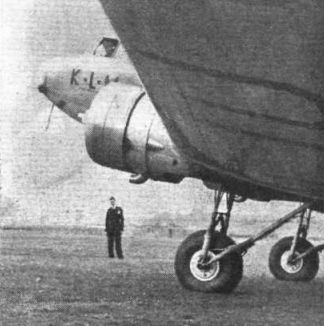 IMPRESSIVE: An ant's-eye view of the K.L.M. 's big Doug!as. 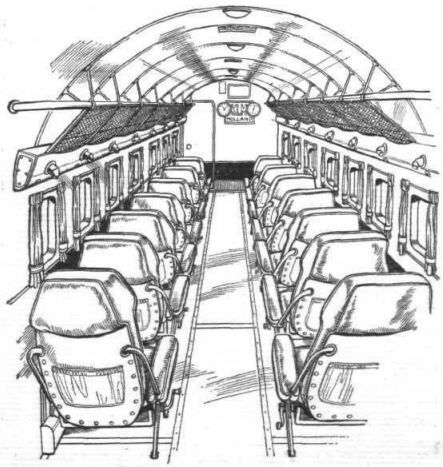 A COMFORTABLE CABIN: Seating accommodation is provided in the Douglas D.C.2 for fourteen passengers. The seats are adjustable for height and angle. 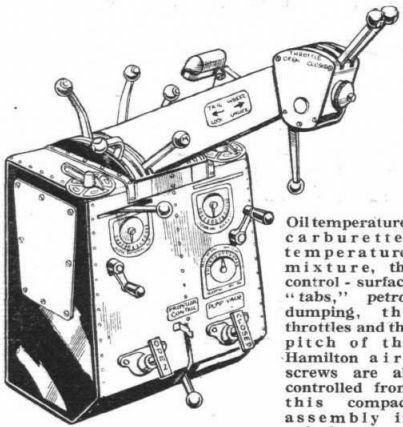 Oil temperature, carburetter temperature, mixture, the control-surface "tabs," petrol dumping, the throttles and the pitch of the Hamilton airscrews are all controlled from this compact assembly in the Douglas. 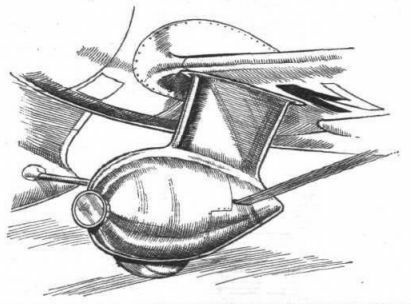 Air vent, landing lights and pitot head on the Douglas D.C.2. Each fixed surface in the empennage of the Douglas D.C.2 is carefully filleted where it joins the fuselage. This skeleton shows also the balancing of the movable surfaces and a portion of the trailing antenna. 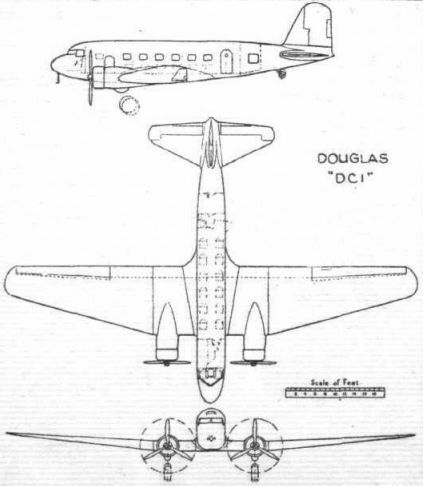 SECOND TO REACH AUSTRALIA: The Douglas D.C.2 is similar to the D.C.1 shown in these general arrangement drawings. The engines are Wright "Cyclones" of 700 h.p. each. THE IRISH ENTRY: Col. J. C. Fitzmaurice flying Irish Swoop, the "hush-hush" Bellanca (Pratt & Whitney "Twin Wasp Junior"). 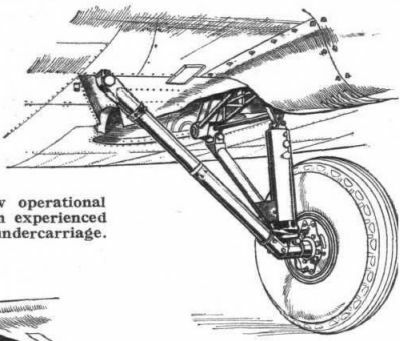 The undercarriage, of course, is retractile. 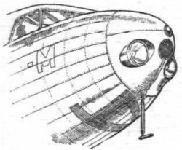 THE "IRISH SWOOP": Col. Fitzmaurice's Bellanca monoplane (No. 29) in course of construction. 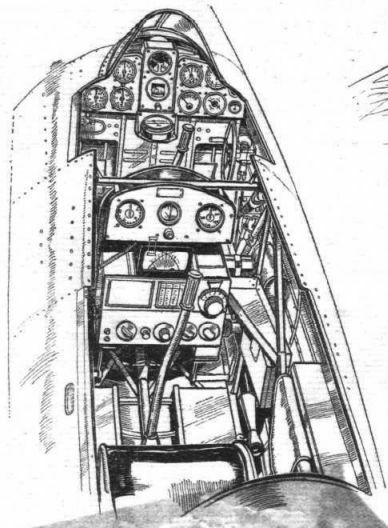 The cockpits of the Irish Swoop (which was withdrawn at the last moment) with the transparent roof removed. The D./F. equipment is of U.S. Navy pattern. 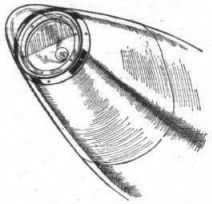 One half of the Irish Swoop's retractile undercarriage. 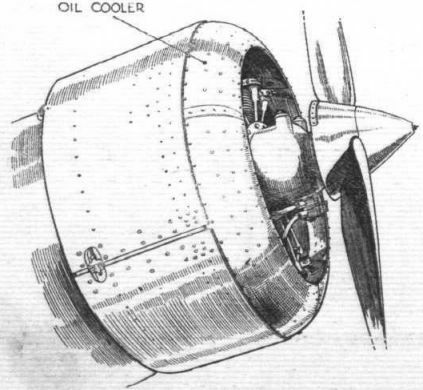 Note the receptacles for oleo leg, radius rod and wheel, and the covering for the latter. The machine was, unluckily, excluded. 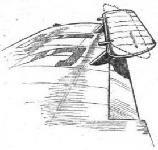 A single top bracing wire on each side of the Irish Swoop's fin braces the tailplane on the centre of pressure. 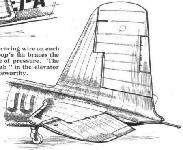 The rudder shape and "tab" in the elevator are also noteworthy. 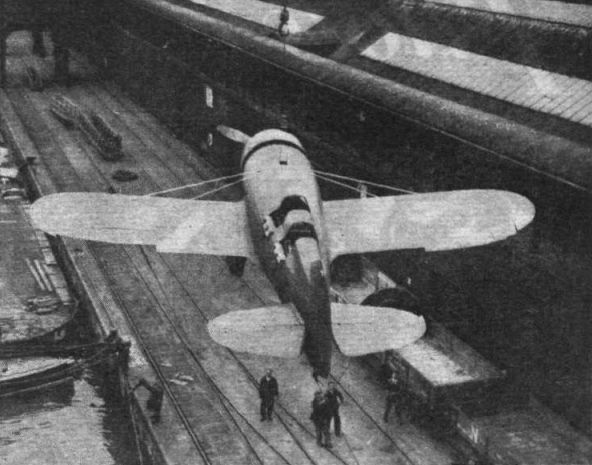 FLYING TO BUSINESS: One of the Bellancas used on the New York - Long Island "shuttle-service," sitting on its 165-ton ramp and turntable in East River during the inauguration ceremony. 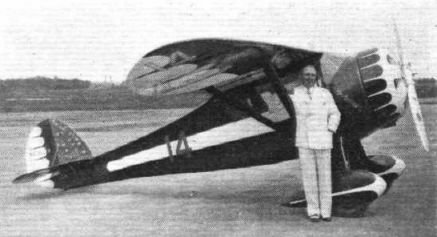 WITH "CLIPPED" WINGS: The Lambert Monocoupe (Warner "Super Scarab") to be flown by Wright and Polando; Wright gave a spectacular demonstration - much too spectacular for the officials - on the morning after his arrival at Mildenhall. INSTRUMENTAL: The layout in "Baby Ruth" is quite exceptionally tidy. 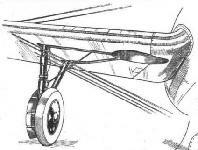 Clean simplicity - the cantilever undercarriage of the Lambert Monocoupe, "Baby Ruth." 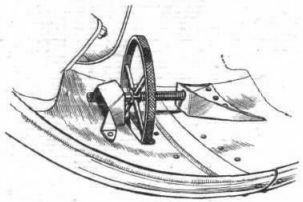 Another "Baby Ruth" detail - the hand-wheel which clamps the N.A.C.A. cowling; its rim projects through the slot. 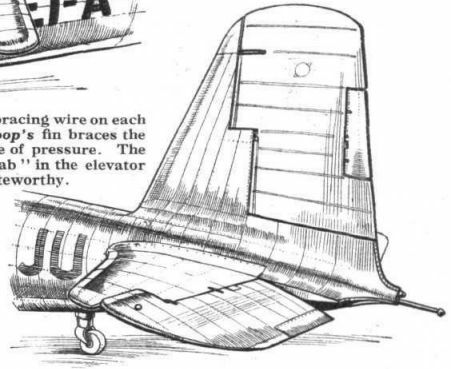 PAN-AMERICAN AIRWAYS' LATEST: The Sikorsky S-42, which ts now replacing the older machines on Pan-American Airways' routes, cruises at 160 m.ph with thirty-two passengers and a crew of four. 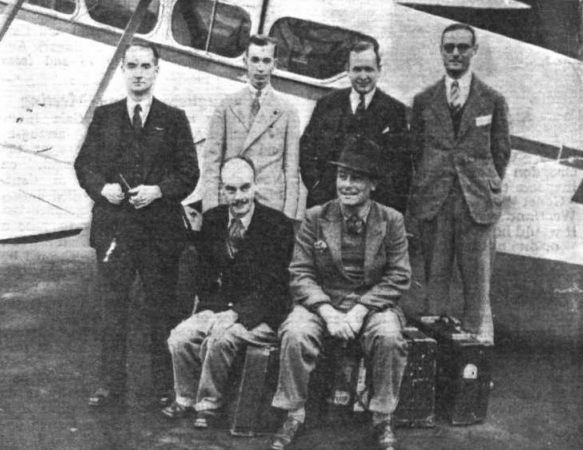 AN EASTERN PILGRIMAGE - NEW STYLE: This party flew, in Mr. Graham Mackinnon's "Dragon," out to Baghdad, there to await the arrival of competitors in the England - Australia Afr Race. 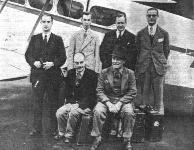 They are, from left to right: (standing) F. Farey Jones, M. O. Gatrell, Graham Mackinnon and K. W. Bear. (Sitting) J. K. Morton, pilot, and Lt. Com. 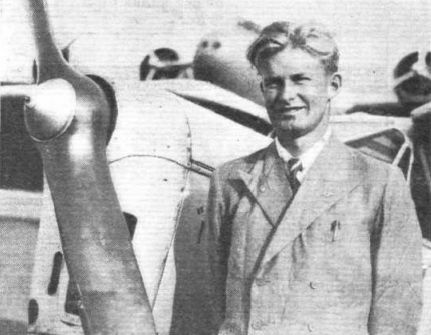 C. N. Colson, R.N., of "Flight's" Editorial Staff, who will keep our readers informed as to the progress of the Race at Baghdad. SPIRITUAL: Flt. Lt. Shaw's British Klemm "Eagle," The Spirit of W. Shaw & Co., Ltd., which is one of the most completely equipped machines in the race. TOEING THE LINE: Another view over the heads of the crowd. The nearest machine is the "Puss Moth" flown by Mr. C. J. Melrose, next to it are the Airspeed "Courier" A.S.5. (Sqd. Ldr. Stodart and Mr. K. G. Stodart), and Fit. 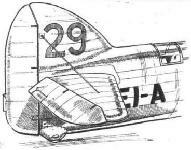 Lt. Shaw's British Klemm "Eagle." These machines were in the Handicap Race. TO NEWMARKET BY AIR: As reported last week, the stewards of the Jockey Club have laid out a landing ground on Newmarket Heath for the convenience of racegoers. 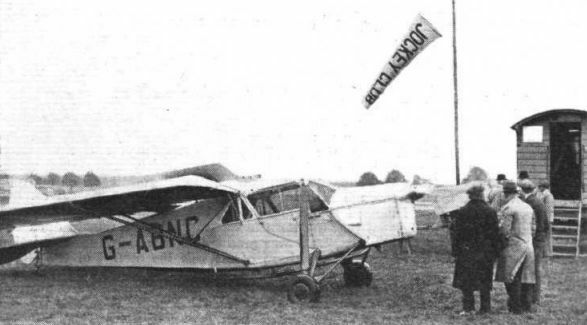 Here is the first aeroplane to make use of this new landing ground - a "Puss Moth" belonging to Lord Willoughby de Broke, who flew to the races on October 2. AT CROYDON: Mr. C. J. Melrose photographed beside his "Puss Moth" soon after his arrival. In the background the Fokker F.XXXVI can be seen. 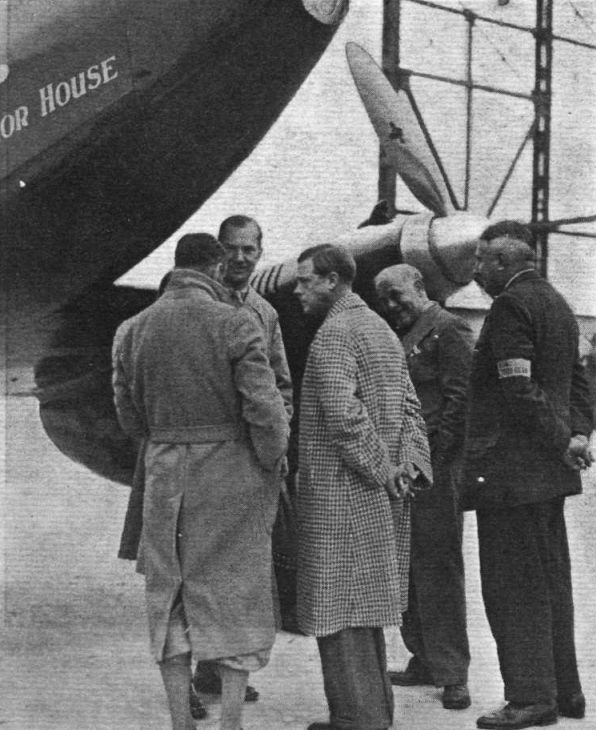 THE PRINCE'S VISIT: His Royal Highness chats with Messrs. Campbell-Black and Scott (on left); on the right are Lt.-Com. H. E. Perrin, Secretary of the R.Ae.C, and Mr. Lindsay Everard, M.P. 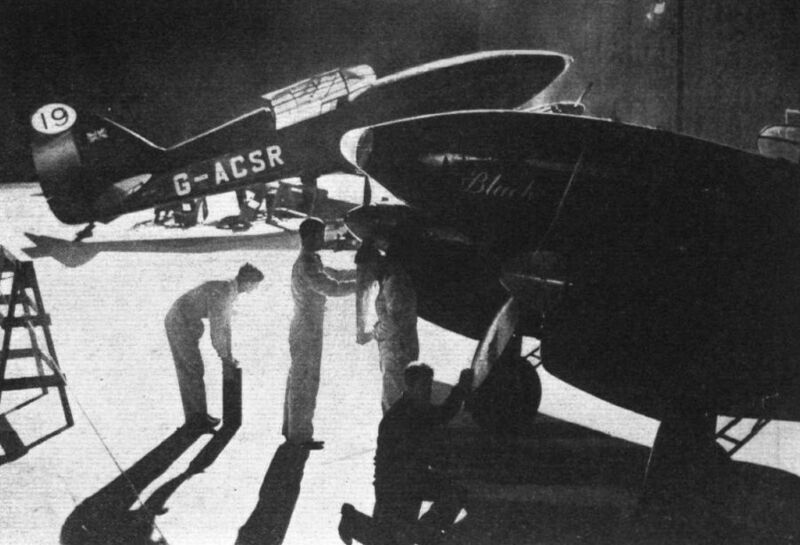 ONE OF THREE: The second "Comet," entered by Mr. A. O. Edwards and flown by C. W. A. Scott and T. Campbell Black, is taxied up to the big hangar. SPOTTING A WINNER! : Mr. Bellamy, the Hon. 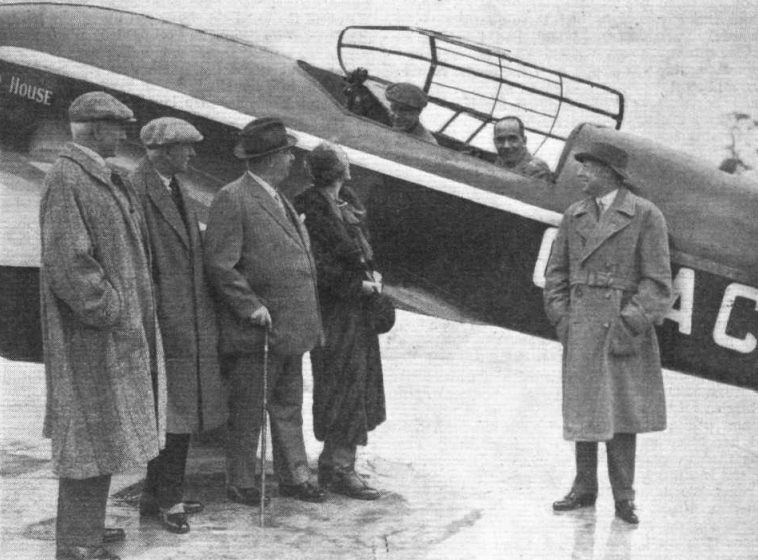 A. Hore-Ruthven, Lord Glanely, Lady Furness and Lord Furness chat with Scott and Campbell-Black, crew of the "Comet" Grosvenor House, who scored such a notable victory. COMETARY: Grosvenor House, "Comet," No. 34, nearing completion at Hatfield, and (inset) the "Comet," nominated by Mr. Bernard Rubin, on test. COMPASS SWINGING: The "Comet" flown by Lt. O. Cathcart Jones and Mr. "Ken" Waller undergoes an important ceremony. 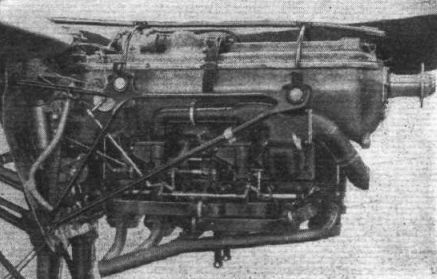 THE SPECIAL RACING ENGINE: The De Havilland Gipsy Six inverted six-cylinder air-cooled engines in the "Comets" had the compression ratio increased to 6.5 : 1 and develop 224 b.h.p. at 2,400 r.p.m. 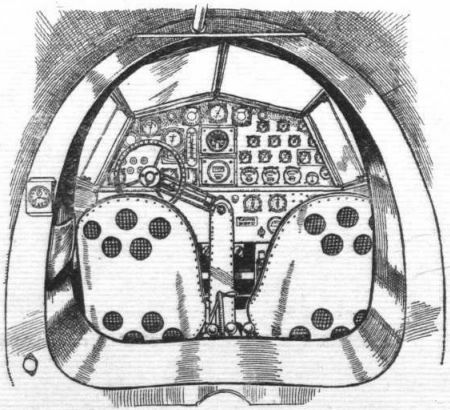 ROOM ENOUGH, BUT ONLY JUST: The diminutive cockpit of the "Comets." 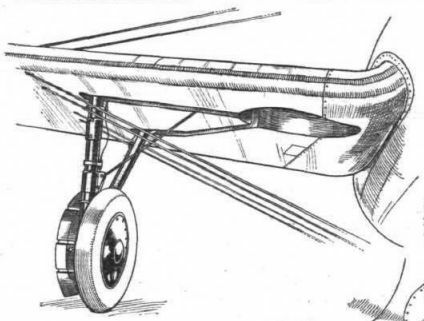 The wheel on the right of the first pilot is for raising and lowering the undercarriage. 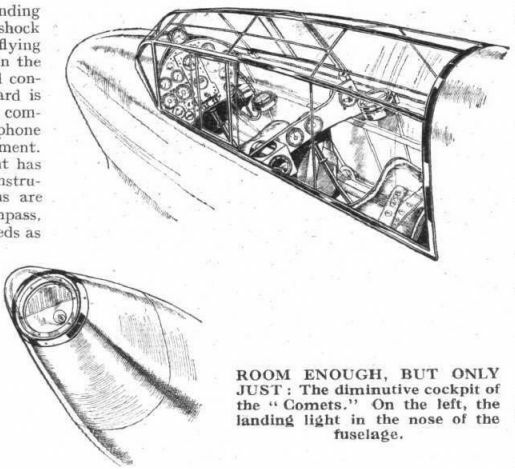 On the left, the landing light in the nose of the fuselage. 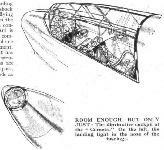 Central headlamps are not a monopoly of trams - the three D.H. "Comets" are so equipped for night landings. SHORTENING THE APPROACH: One of the split flaps on the "Comet." 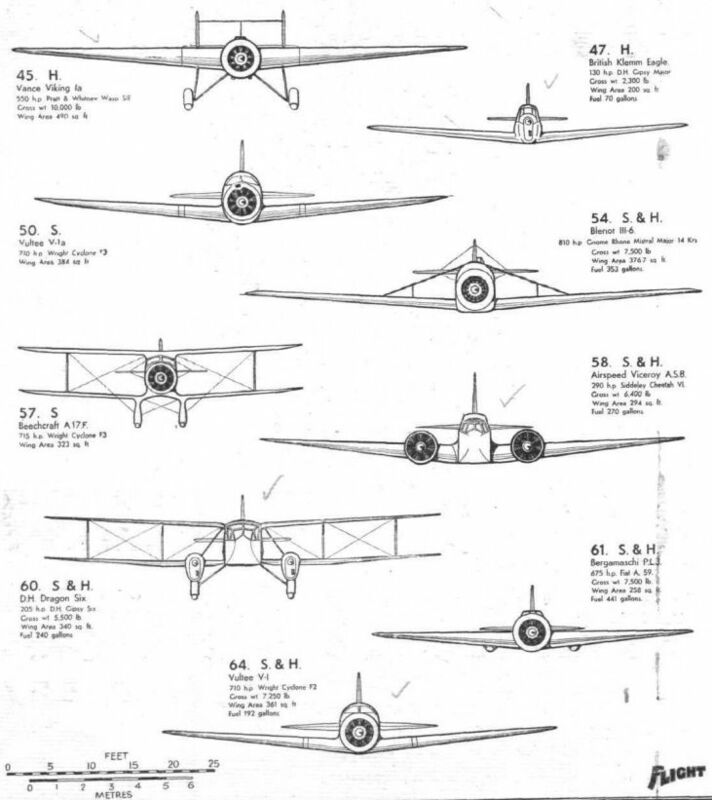 These are raised and lowered by a lever on the left of the first pilot. THE "COURIER" IN THE RACE: Sqd. Ldr. Stodart's Airspeed "Courier" coming up to the hangar on Sunday afternoon. This machine arrived immediately after the "Viceroy." 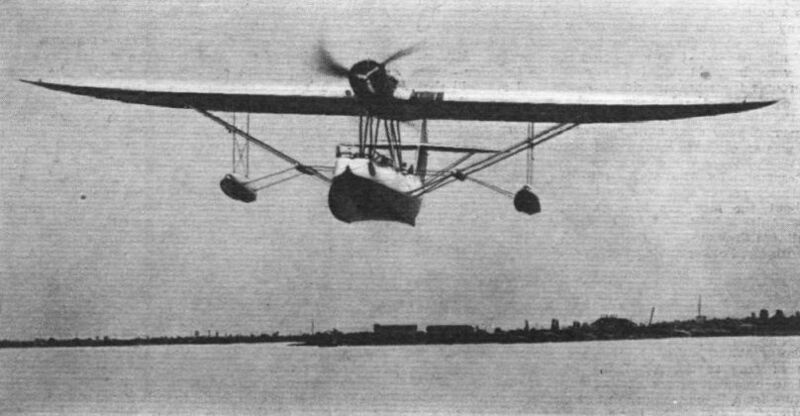 A RETRACTED LANDING: Sir Alan Cobham's Airspeed "Courier" as it landed at the Halfar Aerodrome, Malta, during his recent attempt on the non-stop flight to India. Sir Alan only just reached the aerodrome by keeping the undercarriage retracted, thus prolonging the glide. 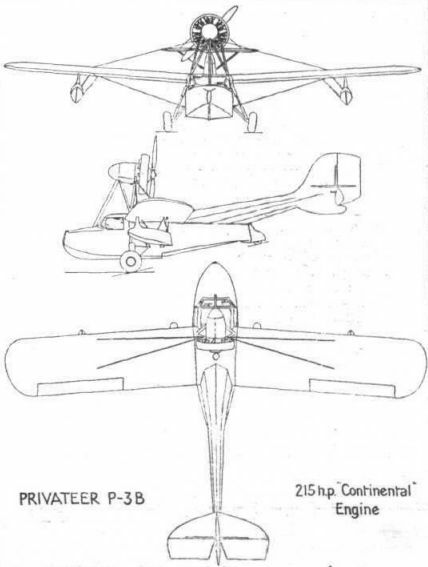 FOR A PORTUGUESE VENTURE: The De Havilland "Leopard Moth" on which Lt. Humberto da Cruz of the Portuguese Air Force intends to carry out a flight from Portugal to Timor, the farthest Portuguese possession. 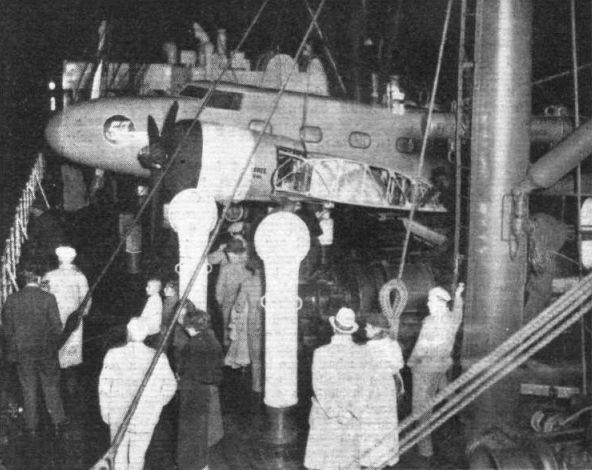 The machine was purchased by a national subscription, and Lt. Humberto da Cruz proposes to fly back from Timor via Hong Kong. HARDLY PRETTY, BUT - : The new three-engined Breguet 393 T. which carries six passengers at 137 m.p.h. on the Toulouse-Casablanca service. DAWN OF ADVENTURE: A striking impression captured by the camera as the sun broke through at Mildenhall. The machine is F.O. 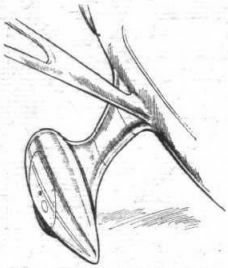 Davies's and Lt. Com. 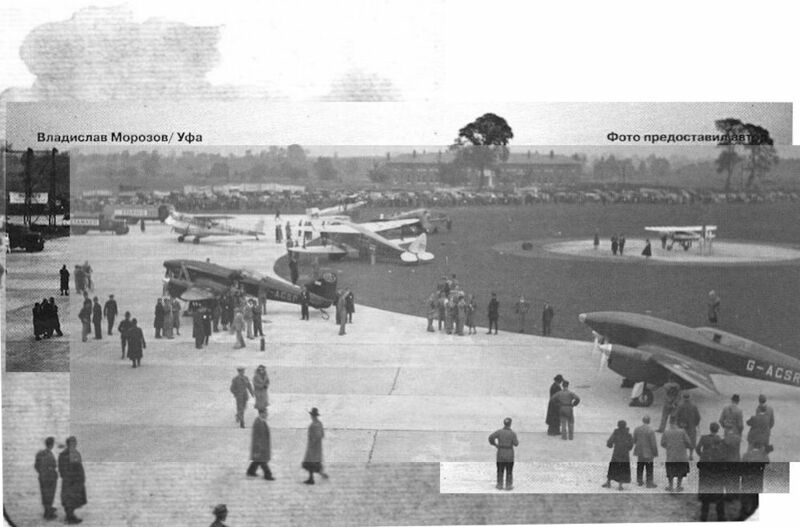 Hills' Fairey III F.
"SKY-HOOKS" at Southampton for Mr. Clyde Pangborn's "Gee Bee" (Pratt and Whitney "Hornet"), to be flown by Miss Jacqueline Cochran. RIDE HIM, COWBOY! 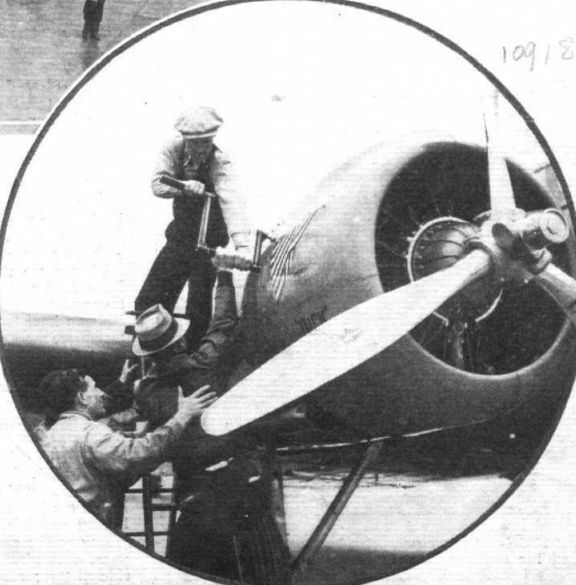 A mechanic secures the cowling of Miss Cochran's Granville monoplane. 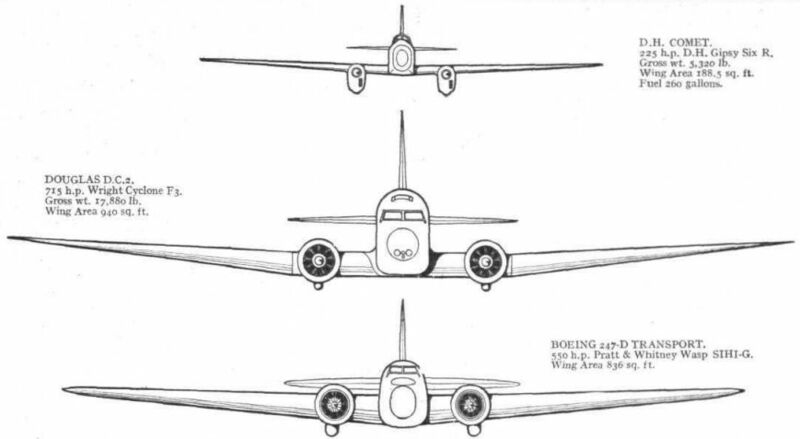 On the right is the Pratt and Whitney "Hornet" uncowled: Note the four Venturis for the duplicated Sperry Artificial Horizons and Gyro-Compasses. Miss Cochran unluckily got no farther than Bucharest. 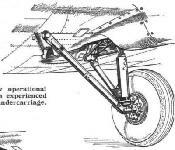 The undercarriage of the Granville monoplane is sturdy and clean. 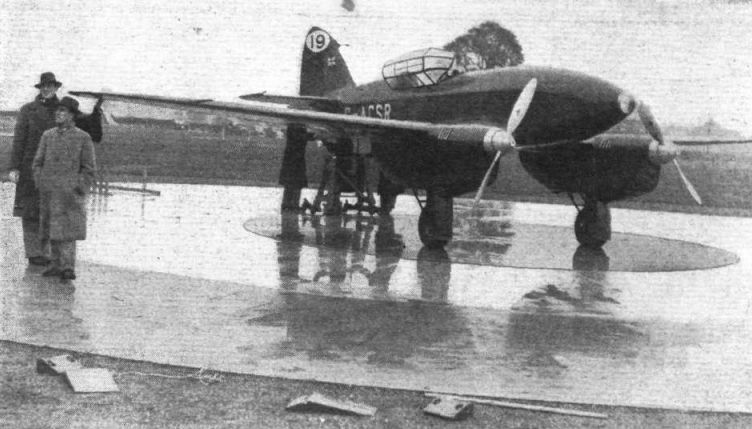 It stood up to some hard knocks at Mildenhall. 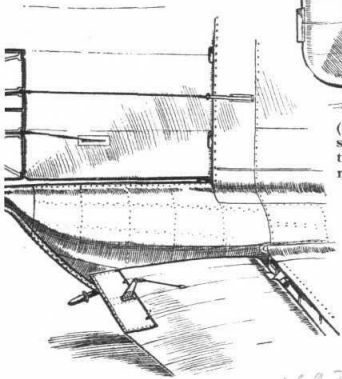 The landing lights in the "spats" are interesting. NO. 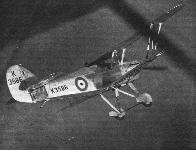 58: The Airspeed A.S.8 (two Siddeley "Cheetah VI") which will be flown by Capt. Stack and Mr. Turner, is similar to the Airspeed "Envoy" in general design, but has more powerful engines. 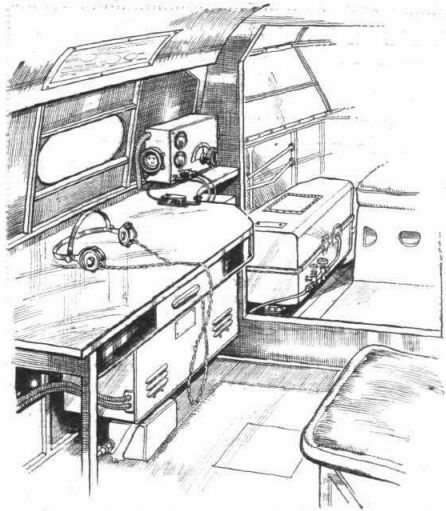 COMPLETE EQUIPMENT: An interior view of Capt. Stack's Airspeed "Viceroy," showing the wireless equipment, the chart table, and, in the pilot's department, the P.B. Automatic Pilot. 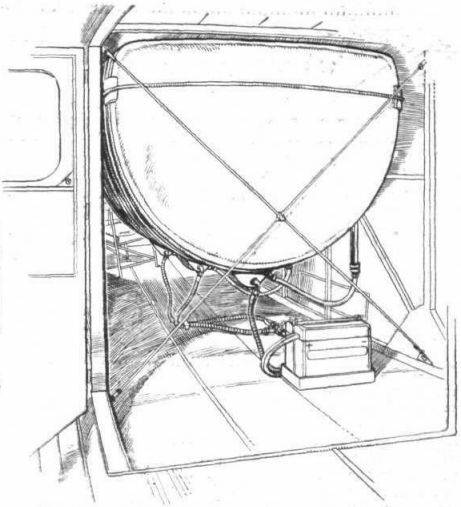 ON THE "VICEROY": One of the landing searchlights which are mounted inside the leading edges on the Airspeed "Viceroy." The aperture is transparently covered. In the Airspeed "Viceroy," or A.S.8, manned by Stack and Tuner, the oil coolers for the Siddeley "Cheetah" VI engines form the leading edge of the cowlings. THE LATEST WIBAULT: This Wibault 366 carries five passengers, or the mail equivalent, at a cruising speed, it is reported, of 190 m.p.h. 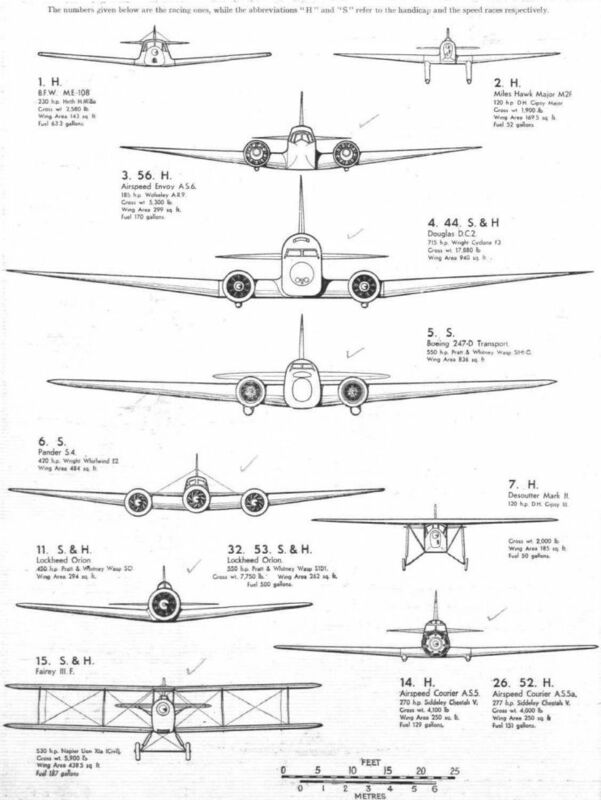 It is of particular interest, if only because the engine, an Hispano-Suiza, 12 Ybr. (860 h.p. ), is water-cooled - which is rare in a commercial machine to-day. 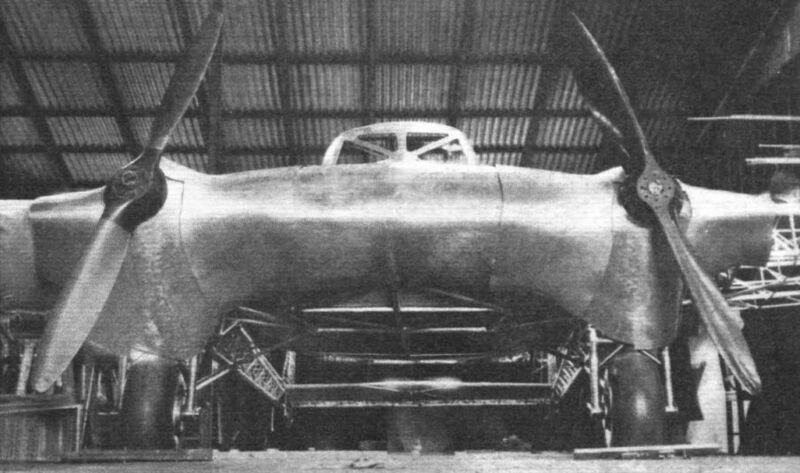 ALL AUSTRALIAN: The Harkness & Hillier monoplane shown here under construction at Mascot Aerodrome, Sydney. It seems improbable that this machine will race. MEXICAN BUILT: The "MWT-1" long-range monoplane, designed by Dr. Michael Watter and built in Mexico. 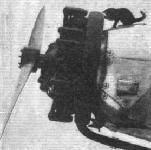 It is fitted with a Pratt and Whitney "Wasp" engine.